Chinese sturgeon is a multi-branched shrub, 0.5-1 m high, more than 2 m tall at the time of cultivation; branches are thin, bow-shaped curved or prolapsed, light gray, with vertical stripes, thorns 0.5-2 cm long, leaves and flowers The thorns are longer and the tip of the branchlets are sharply pointed. Leaf paper or cultivated material is slightly thicker, single leaves alternate or 2-4 clustered, ovate, ovate-ovate, oblong, ovate-lanceolate, apically acute, base cuneate, 1.5--5 cm long, 0.5-2.5 cm wide, growers larger, up to 10 cm or more, up to 4 cm wide; petiole length 0.4-1 cm. Flowers on long branches are solitary or twin in leaf axils, and on short branches they are clustered with leaves; pedicels grow 1-2 cm in length and gradually thicken toward the top. Calyx 3-4 mm in length, usually 3-lobed or 4- or 5-lobed, lobes somewhat ciliate; corolla funnel-shaped, 9-12 mm long, lavender, tube abruptly spreading upward, slightly shorter than or nearly equal to ankle Lobes, 5-parted, lobes ovate, apically rounded, flattened or slightly recurved, margin ciliolate, base auricle prominent; stamens shorter than corolla, or corolla lobe extending out of corolla, filaments near At the base, a circle of villi and interwoven into elliptical hairy clusters are densely formed, and the inner wall of the corolla tube at the height of the hairy tussock is also densely villous; the styles are slightly elongated and the upper end is bowed and the stigma is green. Berries red, ovate, growers can grow round or oval-shaped, tip apex or blunt, 7-15 mm long, growers up to 2.2 cm in length, diameter 5-8 mm. Seeds flat kidney-shaped, 2.5-3 mm long, yellow. Flower and fruit period from June to November. Looking for ideal Fresh Goji Berries Manufacturer & supplier ? We have a wide selection at great prices to help you get creative. All the Goji Berry Plant For Sale are quality guaranteed. 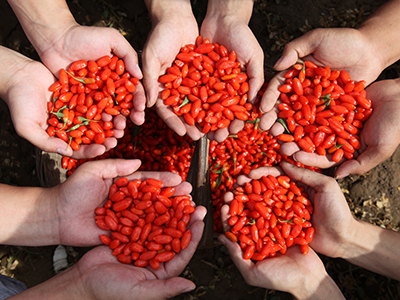 We are China Origin Factory of Goji Berry Fruit. If you have any question, please feel free to contact us.